Fact- Insertion of Article 35A in the constitution is adding a new provision in the Constitution of India. The power of addition and deletion of the constitutional provision rests with the Parliament of India as per Article 368 of the Indian Constitution. But the addition of Article 35A was done by the President, who overstepped his authority. Also, this provision is neither available between Article 35 and Article 36 of the Constitution of India nor in the list of the constitutional amendment. This provision was available in the appendix for more than 60 years and perhaps no Indian citizen, including legal practitioners knew about it. By insertion of Article 35A, the doctrine of the basic structure of the Constitution of India was violated in Jammu and Kashmir. This clandestine nature of insertion and without the involvement of Parliament clearly showed that its entry was deceitful. Therefore, Finance and Corporate Affairs of the Government of India Arun Jaitley has rightly said that “Article 35 A was “surreptitiously” included in the Indian Constitution and it was a “historical blunder” committed by Jawaharlal Nehru. 2. India Express- Article 35A grants immunity from being annulled on the ground that they infringe one or the other of the fundamental rights guaranteed by the Constitution……………………. The basic principles committee of the J&K Constituent Assembly, which was set up in 1951, presented its report to the Constituent Assembly in February 1954. As a part of the report, an annexure which listed out the provisions of the Constitution of India, besides Articles 1 and 370, that should be made applicable to J&K. This annexure included, among other Articles, Article 35A. Fact- First of all Article 35A was not available in the Constitution of India in 1950 and it came into being on May 14, 1954, when President of India issued ‘The Constitution (Application to Jammu and Kashmir) Order, 1954’. 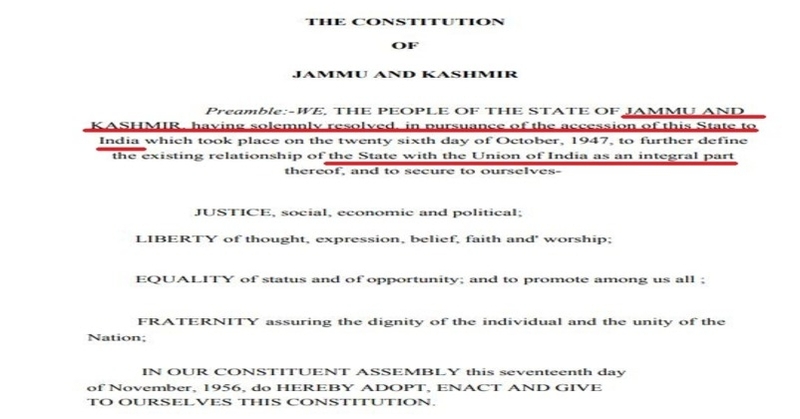 Therefore, it is not possible that the basic principles committee of the J&K Constituent Assembly mentioning Article 35A as one of the provisions of Constitution of India in February 1954 in its annexure. Hence, the claim of the author is untrue or a larger conspiracy was hatched even before 1954 to violate the provisions of the Constitution of India. Also, if we go by the claims of the writer that Article 370 was used to amend and modify the provisions of the Constitution of India, Article 35A was not the part of the constitution of India and the discussion on this provision was not only inappropriate but illegal as well. Secondly, the President of India does not have the power to add a new provision in the Constitution of India, as this power rests with the Parliament of India under Article 368. Lastly, in Keshavananda Bharti Versus State of Kerala AIR 1973 SC 1461 case, Hon’ble Supreme Court has held that the Parliament of India cannot make any amendment in the basic structure of the Constitution of India. Article 35A make alteration and thereby deny fundamental rights guaranteed to the petitioners and their class under Articles 14, 15, 16, 19(1)(d), 19(1)(e) and 19(1)(f), Clause (7) of Article 19, 21, 29(2) and 32 of the Constitution of India. 3. Indian Express- The Prime Minister of India, Jawaharlal Nehru, and Prime Minister of J&K, Sheikh Mohammed Abdullah, reached an agreement…… The terms of the agreement, where the sharing of sovereignty was detailed, were presented to the Lok Sabha. On his part, Abdullah briefed the J&K Constituent Assembly in what is a famous speech in the history of J&K. Fact- India is a sovereign country and the concept of ‘shared sovereignty’ is not found in India. In the case of State Bank of India v. Santosh Gupta and Anrs, the Hon’ble Supreme Court in its judgment, delivered on 16.12.2016, stated that the State of Jammu and Kashmir has no vestige of sovereignty outside the Constitution of India and its own constitution which is subordinate to the Constitution of India. Hence, the notion of shared sovereignty is completely baseless. Fact- As per A.G. Noorani Article 370 and Article 35A define the relationship between India and J&K. But he needs to correct his understanding about J&K, which is an integral part of India. He must understand that the state of Jammu and Kashmir acceded through the Instrument of Accession (IoA), which was signed by Maharaja Hari Singh. This was the only legal instrument through which any other princely states acceded to India and Maharaja Hari Singh signed the same IoA that was signed by the ruler of any other princely states. And this accession cannot be reversed back either by India or the state of Jammu and Kashmir. 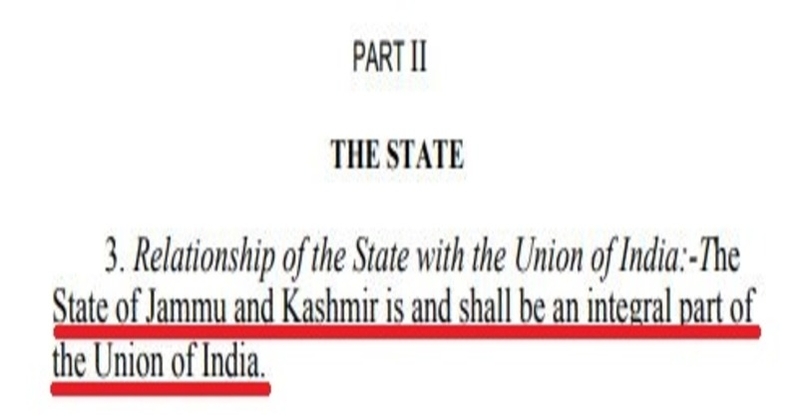 Additionally, the preamble and Section 3 of the Constitution of Jammu and Kashmir mention that the state of Jammu and Kashmir is and shall be an integral part of India and Section 147 of this same constitution states that alteration in Section3 is not possible. The relationship of India and J&K is also defined in Article 1 of the Constitution of India. But if these provisions are ignored by a learnt legal practitioner like Noorani than calling him the most authoritative voice on the constitutional relationship between India and J&K is questionable. Also, Dabru’s claim about Article 35A and linking it with the relationship between India and J&K is nothing but political opportunism to divert the attention of people from real issues. 5. The state subjects of J&K will cease to be citizens of India and entry of Indian nationals into J&K will be restricted. Fact- Part-II of the Constitution of India deals with Indian citizenship and this clause is applicable in the State of Jammu and Kashmir since 1950, when the Constitution of India came into being; hence, clubbing this clause with Article 35A is best recipe for misguiding the people.